I am really excited to be taking an online art class by Jane Davenport and Joanne Sharpe called Miss Quoted. Jane taught me how to draw faces and use color to express mood. 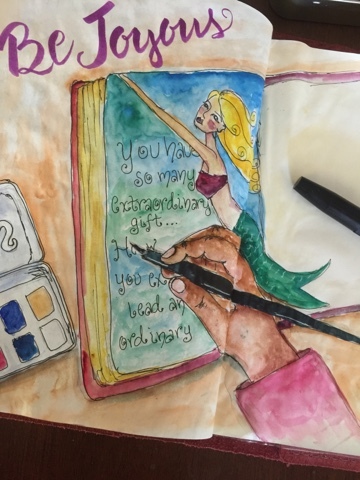 Joanne taught me that illustrating quotes means making your words stand out. And now, they have combined to offer a new class!! 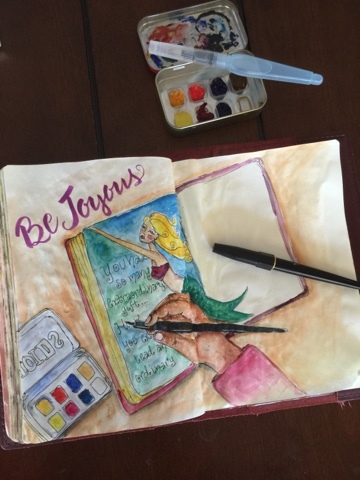 Dawn Nicole - "Be Joyous"
And there is nothing more well loved than my Seven Seas Standard journal and my Platinum Carbon Pen! I've put the Daniel Smith paints in my travel palette (an old Altoid tin and empty gym tray as the paint holder). And did you know today is National Fountain Pen Day? I hope you have a wonderful weekend!! Very nice, Angelcake! You enjoy your weekend too.